SMC4 uses checklist driven advance case management and workflow to ensure work is progressed consistently, accurately & efficiently. This is coupled with strong business reporting capabilities, straight-through automation and location independence, to deliver real competitive advantage. Advance Case Management and Workflow is a term used to describe the way an organization handles interactions with an individual customer. Activities needing case management or workflow are typically in the areas such as Application Processing, Customer Acquisition or Customer Service (Complaints Handling, Arrears and Claims Processing etc.) �Cases� have a life span lasting hours, days or weeks, rather than short activities which last minutes and are usually associated with a call center. At a fixed price, in a fixed time. Output from 3rd Party Systems - PDF, XML, HTML, CSV etc. This SMC4 central repository approach means that complex data is not left within islands but instead forms part of a common knowledge base that is accessible to all with appropriate security levels. This is particularly powerful and beneficial to the customer when interactions reach across front and back office, internal departments, suppliers or regulatory bodies. SMC4 provides a dynamic Case Management container with links to all the relevant pieces of information required to complete a social media communication or work request. SMC4 includes all records of interactions and contextual information such as case notes, audit logs, work completion codes, routing information, security and supporting customer data from other systems - such as from a CRM or billing system. 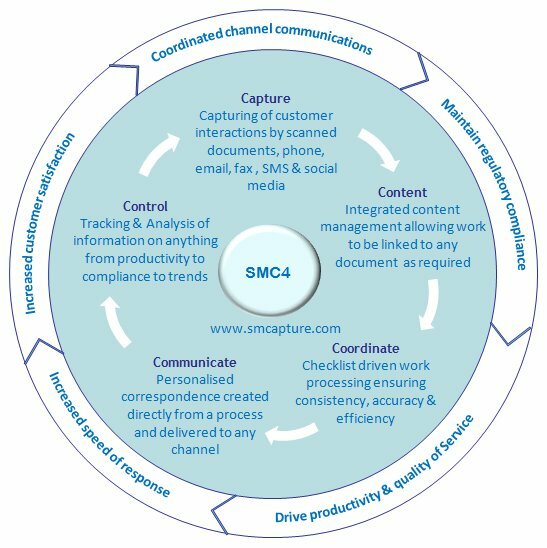 SMC4 enables �work� to be managed through one or more processes, escalating and reallocating as required. Staff are presented with social media communications and or cases though a set of prioritized work queues. As they pick up an social media open case all the necessary information is available to them so that they can complete the stages. Checklists can be used to guide them through a number of steps. Processes are highly configurable and can be strictly defined, or made more flexible depending on a user's privileges. E.g. a supervisor may have the ability to override, or redirect Social Media communication work activities, whereas a customer service agent has to follow the path. If you would like more information regarding Case Management just send us an email to sales@smcapture.com and a representative will contact you.